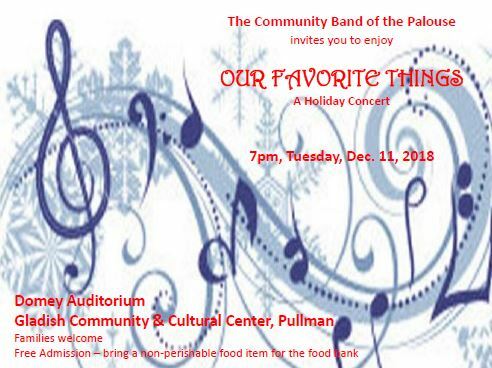 Join us Tuesday evening, December 11, 2018, 7:00 PM in the Domey Auditorium of Gladish Community and Cultural Center for some of “Our Favorite Things” – A Family Holiday Concert. Special guests include Beverly Wolff, Director of Pullman Montessori School; The Kamiak Woodwind Quintet; and Katie Berndt, Vocal Student at WSU. Music includes Leroy Anderson’s Sleigh Ride, Selections from the Sound of Music, other favorites and a reading of ‘Twas the Night Before Christmas. Admission is FREE and donations for the Food Bank are appreciated. Come bring the whole family for an evening of Musical Favorites!